Hotel and Motel | GEF, Inc.
Pultruded fiberglass handrail, fencing and other structural profiles offer low maintenance, great looks and easy installation to the hotel/motel industry. A number of major hotel chains, including Fairfield Inns by Marriott, Red Roof Inns, Drury Inns and LaQuinta Inns, have turned to these great products that solve corrosion and maintenance issues. Twenty-four Fairfield Inn hotels throughout eight Midwest and Southern states installed new stairwells fabricated of fiberglass handrail, structural members, stairs and landings. Fiberglass replaced traditional materials such as concrete, steel and aluminum for long-lasting, cost-effective solutions to the severe corrosion created by the harsh winters and salts used to melt snow on roads and parking lots. A custom handrail, with a 2" half-round blue top rail and white pickets, was designed to blend into the existing architecture. In addition, an 8" x 1-1/2" x 1/2" angle was developed as a riser cover for the stairs. The handrail and stairs were all prefabricated and the treads and stringers were put together with the riser covers ready to set into place in one piece. Red Roof Inns found a perfect solution designed especially for its second floor balconies - an E-channel to encase the exposed edge of the concrete walkways. They chose EXTREN® Series 525 structural shapes, along with the custom E-channel to replace badly corroded steel handrails, stair landings, canopy covers and canopy supports at several of their motels. Constant exposure to salt, water and urban pollution resulted in the steel structures showing excessive corrosion. The fiberglass components were easier to install than the original steel structures and are expected to last up to five times longer. Additionally, maintenance costs at Red Roof Inns have been significantly reduced. All fiberglass components are pultruded in custom colors (beige or dark brown) and coated with a urethane base paint before being shipped to the job site. All visible components are painted. When changing out handrail systems on other motels in their chain, Red Roof Inn plans to replace all the steel with fiberglass. Drury Inns has established a new look for its fencing and exterior railings that saves on maintenance and replacement costs. 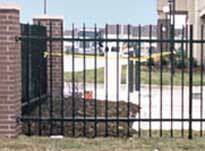 Fiberglass fencing made from 2" and 1-3/4" EXTREN® square tube, custom pultruded in brown or black, is fabricated to look like wrought iron. The result is an attractive, long-lasting alternative to iron or steel that is corrosion resistant and doesn't need painting. The new FRP fabricated fencing and railing is now standard for all new Drury Inns construction and any renovations. 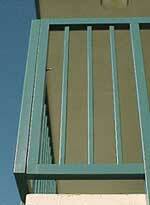 It is used for perimeter fencing and exterior railings for balconies, stairs and pools. 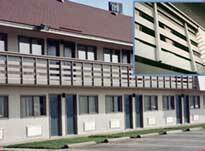 Drury Inns selected fiberglass for its lower installed costs, low maintenance and ease of assembly. 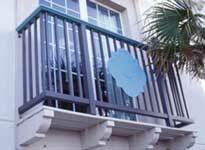 At the LaQuinta Inn in Galveston, Texas, FRP handrail was chosen for the balcony's handrail to eliminate corrosion issues the hotel was experiencing with steel handrail. 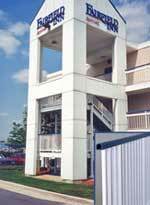 Prefabricated custom fiberglass structures, stairs and landings were also installed. This custom fiberglass handrail system was installed for Motel 6 locations in Corpus Christi, Texas, and Biloxi, Mississippi. FRP pool rail and stairs were also installed at the Corpus Christi location.